OK...This is the official 200th post of this blog and this calls for a celebration. For a foodie, celebration means something sweet and delicious and I'm dedicating this special post to one such recipe which was my to-try list for long time and last week finally I made it possible and baked a perfect Caramel Custard. 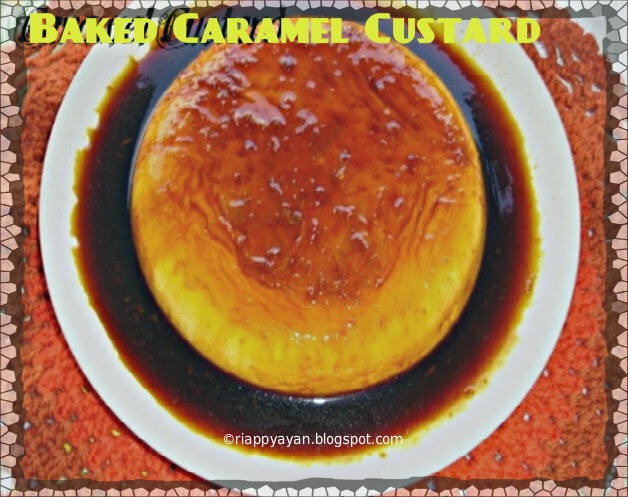 Caramel custard is one of my favorite dessert and it's very easy-to-make dessert, too. I love every bit of it and specially love to make the caramel. I've prepared it before in pressure cooker but never baked it. So this time with all my courage gave it a shot to bake it and it came out perfect, all rightly set and I was very happy with the outcome. 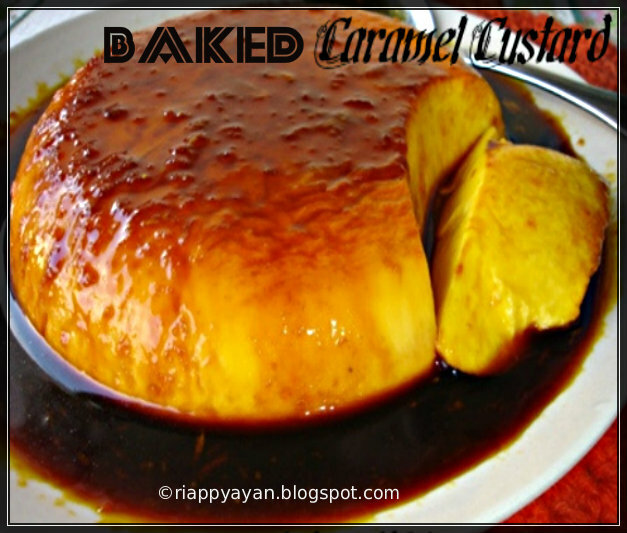 For flavour, I added orange zest to the caramel sauce and it was heavenly. In winter, orange zest can eb a great add-on, but you can bake without it, too. 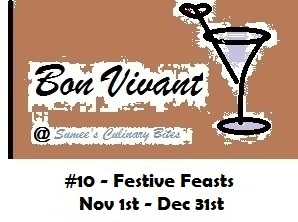 It's a great Christmas dessert as well as for any special occassion. To bake Caramel Custard, you need two baking trays - one big and one small. The small one to bake and the bigger one to give the baking pan/moulds a water bath. Another important thing is that your custard's taste will depend on the caramel sauce, So take care not to burn the caramel sauce. Preheat oven to 220 degree C/375 degree F.
Take a pan, preferably non-stick, add 1/2 cup brown sugar. Add 2 tblsp. of water and let it melt in medium flame. Add orange zest. Stir continuously until it melts completely and starts to change the color to brown and finally caramelize and turns into a nice golden-brown color sauce. Pour the caramel sauce into your greased baking pan or small ramekins where you want to bake. Set aside. In a large bowl, whisk together milk, beated eggs, sugar, salt and vanilla extract until nicely mixed. Now through a strain, pour this mixture into your prepared baking pan or small moulds or ramekins. Now fill the bigger baking tray with 1 inch water and place prepared tray with custard into bigger tray. Put into the oven and bake for about 45 to 55 minutes. When a knife inserted in ther center comes out totally clean then you know it's done. Remove from oven, bring to room temperature and then chill for at least 2 hours to completely set. When set, to unmould, run a knife around the edge of the custard pan. Then place a bigger serving plate over your custard pan and quickly turn and carefully take out the pan. By this time, caramel syrup will have turned into a delicious syrupy glaze. Cut into pieces and serve. If you prepared it into moulds or ramekins, place a serving plate over each moulds and carefully turn and take out the moulds. 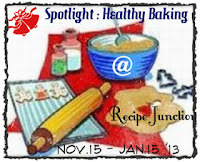 Sending this heavenly Caramel Custard to my ongoing event, Spotlight : Healthy Baking, which ends January 15th, 2013...friends, send more of your wonderful creations to this event. wow....looks delicious dear :)beautiful clicks. Seriously am in love with ur orange sauce, congrats on ur 200th post Indrani,keep on going cak. Delicious custard. Congrats on 200th post. Congrats on your 200th post. Custard looks delicious and inviting..
Hi Indrani, wonderful site you have created. Please suggest whether I can add lemon zest to get a lemon caramel sauce and your opinion whethet it would taste nice. Hi Jhimli, thanks for your nice words, its really encouraging. Yes, you can absolutely add lemon zest and it will definitely test good though I have never tried it. You can definitely give it a go for experiment purpose, you never know unless you try. Isn't it?